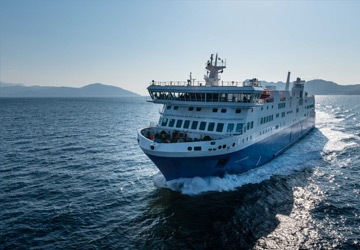 The Venice Porec ferry route connects Italy with Croatia and is currently operated by 2 ferry companies. The Venezia Lines service runs up to 7 times per week with a sailing duration of around 2 hours 45 minutes while the Atlas Kompas service runs up to 6 times per week with a duration from 3 hr 30 min. 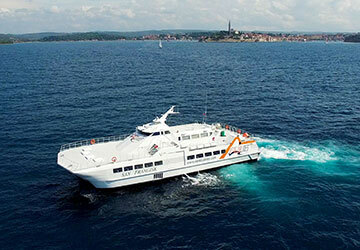 So that’s a combined 13 sailings on offer per week on the Venice Porec route between Italy and Croatia. Compare now and get the best fare at the time that you want to travel. "First visit to Croatia from Venice"
We found the ferry terminal in Venice easy enough although nobody there had any idea if it was the right place. 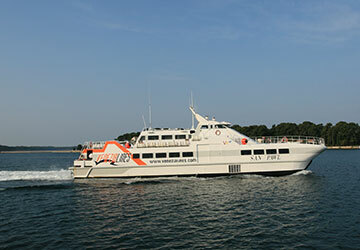 Atlas staff did not arrive until one hour before and no other staff knew of the ferry. Easy to reach by water bus. Boarding and unloading fast and easy. Spacious indoor decks with plenty of seating. It is a pity windows are not cleaned regularly for viewing but it is probably a waste of time with sea spray. Limited space on top deck for open air viewing of departure from Venice. Arrival at Porec on time and easy access to town from the jetty which is in the small town. There are bars and refreshments on board. "First class bit of a let down"
We paid extra for first class and although the lounge was very nice and comfortable the rest was totally unorganised. They gave us a menu to order food and drinks from however when we asked for peroni - didn't have it, a Bellini- didn't have it, a glass of wine - didn't have, bacardi and coke - it didn't have so we gave up in the end and just had a coke! They made a big thing of letting us off the boat before the other passengers and telling us our luggage would be on the dock waiting for us however when we got off the boat it was not so we had to wait until all the other passengers were off before they could find our luggage by which time there was a huge line for passport control. Basically totally unorganised from start to finish not impressed. Positive opinion on everything but when we arrived in Parenzo was raining and the staff throv away all the luggages like they were rabbish. 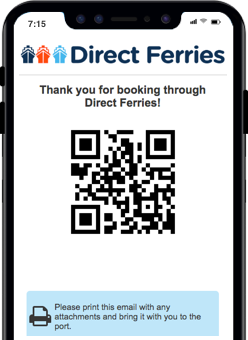 "Put the address to the ferry terminal on the booking confirmation"
Nothing to complain about other than it didn't say anywhere in the booking confirmation where the ferry departed from. All we could see was that it departed from Venice which after all is a pretty big city. On the way out, there were problems with one of the engines. Passengers were kept well-informed. And ship is clean and neat. Disembarkation went smoothly too. The return trip went well, had a nice trip. "Good way to get where you want to go!" Porec is a Croatian town and the most popular holiday resort in Istria and is frequently voted the top resort in Croatia by the Croatian National Tourist Office. The principal tourist areas in the town are the two bays that lie to the south of the town. They are named Zelena Laguna (Green Lagoon) and Plava Laguna (Blue Lagoon) and are almost like small towns in their own right with their own hotels, camping facilities, a marina and shopping and entertainment areas. There are a number of sights of historical interest to be found in Porec's Old Town which include the 6th century Euphrasian Basilica which is beautifully preserved and is well known for its gold mosaics. The Basilica, which was declared a UNESCO World Heritage Site in 1997, is in fact a collection of buildings that includes a baptistery and the Bishop's Palace. Ferry services from the town's port depart to Venice in Italy.